This would be a great appetizer or main course! Who wouldn't love this? Grease a cake pan, bread pan or a bundt pan. 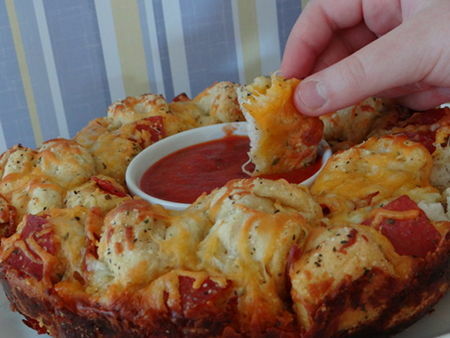 Prepare pizza dough and roll it out. Use a pizza cutter to cut it into 1" squares. It does not need to be exact. Roll the pieces into little balls and put into a bowl. Add the remaining ingredients (except cheddar cheese) and mix by hand to coat it all well and evenly. Put mixture into your pan and sprinkle the cheddar cheese on top. Bake for about 30 minutes or until the top is crusty and brown. Invert pan on your serving plate. To help it come out easily, run a butter knife along the edges of the pan to loosen the bread. 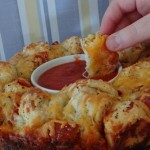 Serve warm with a low carb marinara or pizza sauce for dipping.